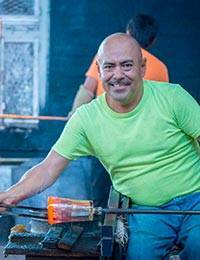 In a marvelous melding of Mexican hospitality and Mexican artistry, Javier and Efren create these handsome drinking glasses of blown glass. Their crystalline depths are encircled with fluid spirals in ebony black. Glasses (6): 1 5 cm H x 10 cm Diam.